(Oakland, CA): Some 260 civil society organizations from around the world have joined forces to send a resounding rejection to the World Bank’s 2015 Doing Business report, which is to be released on October 29. Since 2002, the Bank’s Doing Business project has been benchmarking and ranking countries on the ease of doing business. It rewards lowering social and environmental safeguards to facilitate foreign investments, thereby allowing the exploitation of natural resources and human capital by foreign corporations and local elites. Upheld as the flagship project by the World Bank, Doing Business has guided other benchmarking projects, including the 2013 Benchmarking the Business of Agriculture (BBA), developed at the G8’s urging. “This race to the bottom, cheered on by the Doing Business metrics, has forced countries to adopt an economic and regulatory environment that favors big agribusinesses and foreign corporations. How the Bank usurped the authority to rank nations–dictating national policies in sovereign nations, which are most harmful to the working poor, the indigenous, pastoralists, and smallholder farmers–remains a puzzle. After years of devastating impacts caused by these rankings, international civil society is rejecting the 2015 report and denounces the Doing Business Rankings as an illegitimate practice for which the Bank has no mandate nor authority,” said Anuradha Mittal, Executive Director of the Oakland Institute. With the World Bank setting standards for investors and bilateral donors and driving significant funds toward the best performers in the Doing Business system, governments refrain from challenging the rankings. Instead, governments set improving their Doing Business ranking as their policy goal, turning to the advisory services of the Bank to guide the implementation of regulations that will improve their score. This practice has undermined national sovereignty while thwarting the necessary public debate on economic and development policies, as made evident by the multi-continental campaign Our Land Our Business. “There are no winners in this race to the bottom created by the Doing Business rankings–today’s version of the structural adjustment programs (SAPs) that devastated the livelihoods of millions of people through the withdrawal of state intervention and the forced liberalization of national economies in the 1980s and 1990s,” said Frederic Mousseau, Policy Director of the Oakland Institute. “With both the Bank’s Independent Evaluation Group and Independent Panel Review questioning the Doing Business report’s relevance in accomplishing the Bank’s goals to eradicate poverty and boost shared prosperity, it is time that governments around the world also reject the rankings and formally end the governance of their nations by the World Bank. “Under the banner #WorldvsBank, this movement is calling for the end of Doing Business rankings and the new Benchmarking the Business of Agriculture project. They are tools of a pro-corporate, anti-poor, environmentally unsustainable model of development. If the World Bank keeps promoting economic activity that destroys biodiversity and the livelihoods of smallholder farmers, pastoralists and indigenous communities, they should not have a mandate to exist,” said Alnoor Ladha of /The Rules. The World Bank’s lending to developing countries reached $35 billion in 2012. The Doing Business rankings play a critical role in determining what form of economic development takes place around the world. According to the World Bank’s own literature, they are “an incomparable catalyst for business reforms initiatives.” In practice, this has meant liberalizing developing country economies so that large-scale land investment and western corporations can move in unimpeded. The casualties are the smallholder farmers and providers who currently feed 80% of the developing world but who are all too often rendered invisible or actively dispossessed. “Working for the World Bank’s Social Fund in Gambella, I protested the widespread coercion and forced relocation of people. Today I live in political exile in Kenya. I am protesting the World Bank on October 10 because I know first-hand how their policies negatively impact communities,” said Okok Ojulu who will share his experiences at actions planned in DC. 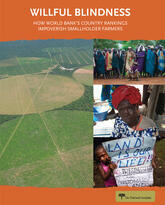 To coincide with the #WorldvsBank mobilization, the Oakland Institute, one of the world’s leading think tanks on land issues, is releasing a new study tackling the Bank’s approach to land, agriculture and development, Unfolding Truth: Dismantling the World Bank’s Myths on Agriculture and Development. In addition, the Institute will also release six new country fact sheets that expose the reforms promoted by the World Bank in Kenya, Uganda, DRC, Laos, Cambodia, and Uruguay. In each country, the bank’s policies have served as a catalyst for massive land grabs, dispossession, and forced eviction of countless small-scale farmers. Our Land Our Business is also launching the world’s first transnational “missed call” campaign — uniting call-to-action across multiple countries. The idea is to make a call to a local phone number; the mobile number is then registered as an expression of support; then supporters receive free text messages to get further involved (e.g. showing up at a creative resistance). In parts of the world where first generation mobile phones are ubiquitous, but computers and the Internet are costly and inaccessible, this is a new powerful tool for mass engagement in political action. October 10 resistance a 4pm in Rawlins Park is followed by further action on October 11 when, at 11 am, activists and concerned citizens from around the world will again gather outside the World Bank to protest the Bank’s attempt to dismantle critical protections for people and the planet that are currently enshrined in its operational policies. These changes come at a time when the Bank is making plans to scale up its lending to the private sector and return to the sort of risky mega-projects that characterized its now discredited Structural Adjustment Programs in the 1980s. October 10 – 11 actions send a message to the Bank that the World won’t stand for its exploitive practices. Civil society organisations around the world are decrying a leaked draft of the World Bank’s proposed new policies to avoid harmful impacts from the development projects that it finances. Despite earlier commitments by Bank President Jim Yong Kim that the policies would not be diluted and that safeguards on land rights would be strengthened, the proposed changes have gutted essential requirements that are necessary to prevent displacement, impoverishment, and environmental damage. The draft policies are up for discussion by the Bank’s board on July 30 ahead of public consultations. “This draft effectively winds back the clock to the 1970s, before the Bank had binding policies in place to protect the poor and the environment. We see nothing more than a naked attempt by the Bank to shield itself from accountability for the destructive impacts of the mega-projects it is planning.” said Madhuresh Kumar, National Organizer of the National Alliance of People’s Movements in India. Most shockingly, the draft policies provide an opt-out option for governments that do not wish to provide essential land and natural resource rights protections to Indigenous Peoples. The draft also weakens protections for people who will be evicted from their homes, land and livelihoods, increasing the risk that Bank-financed projects will impoverish people, exacerbate inequality and cause human rights violations. The proposal scraps critical rules that have been in place for thirty years requiring the Bank to take concerted measures to avoid and minimise displacement and for resettlement action plans capable of restoring the livelihoods of the displaced to be in place before committing funds to projects. It provides multiple opportunities for borrower governments, or even private “intermediary” banks, to use their own standards for impact assessment, compensation and resettlement, without clear criteria on when and how this would be acceptable. “The Bank is trying to exonerate itself from all responsibility for the devastating effects of the displacement it finances, while giving private equity funds and some of the world’s most abusive governments unfettered discretion to uproot the poor as they fit,” said David Pred, Managing Director of Inclusive Development International. Land titling projects are exempted from the coverage of the draft resettlement policy. This will leave affected communities completely unprotected from forced eviction by their government, as happened in the case of Cambodia’s Boeung Kak Lake community whose homes were demolished after they were deemed not to have ownership rights under a Bank-titling project. “If this policy is adopted, many communities around the world will be forcibly evicted like mine was, and they will not be able to seek any recourse from the Bank,” said Tep Vanny, a community leader from Boeung Kak Lake. After filing a complaint with the World Bank’s Inspection Panel about the controversial project, Tep Vanny and local organisations finally secured title for hundreds of families that were previously threatened with eviction. With the proposed changes to the Bank’s policy, that would not have been possible. Despite the growing land-grabbing crisis displacing countless indigenous communities, small farmers, fisher-folk and pastoralists throughout the global south, the draft policy fails to incorporate any serious protections to prevent Bank funds from supporting land-grabs. “In Ethiopia, World Bank funds have been used to facilitate one the world’s biggest land grabs, with the indigenous populations of entire regions being uprooted to make way for agro-industrial investments. We had hoped that the new safeguards would include strong requirements to prevent governments like Ethiopia from abusing its people with Bank funds, but we are shocked to see the Bank instead opening the flood-gates for more abuses,” said Obang Metho, Executive Director of the Solidarity Movement for a New Ethiopia. “Not only is the current draft an unconscionable weakening, it is a complete misrepresentation of two years of consultations with civil society. The Bank’s Board must not endorse this draft, and at a minimum must insist that these fundamental loopholes be addressed before the next round of consultations,” said Sasanka Thilakasiri, Policy Advisor for Oxfam International. 99 non-governmental organizations and civil society networks and 17 distinguished individuals from Asia-Pacific, Africa, Latin America, North America and Europe sent a statement to the World Bank’s Board yesterday, demanding that the draft be sent back to the drawing board and re-written with serious safeguards to respect and protect the land, housing and livelihood rights of the poor. The joint statement is available here. The leaked World Bank draft safeguards framework is available here. Oakland, California–A new report from the Oakland Institute, Walking on the West Side: the World Bank and the IMF in the Ukraine Conflict, exposes how the international financial institutions swooped in on the heels of the political upheaval and are vying to deregulate and throw open Ukraine’s vast agricultural sector to foreign investors. Former Ukrainian President Viktor Yanukovych’s rejection of an EU Association agreement in favor of a Russian deal was a major factor in the crisis that led to his ouster in February 2014. Immediately following the change to a pro-EU government, the country’s pivot to the West was solidified with a $17 billion loan from the International Monetary Fund (IMF) and an additional $3.5 billion aid package from the World Bank, both of which require significant economic reforms and austerity measures that are set to have disastrous effects within the nation. “While the World Bank and IMF often disguise their activities in other countries under the objectives of development, the case of Ukraine makes it clear that this is just Orwellian double-speak. Their intent is blatant: to open up foreign markets to Western corporations. It’s telling that one of the key reforms enforced by the Bank is that the government must limit its own power by removing restrictions to competition as well as the role of state ‘control’ in economic activities,” said Frederic Mousseau, Policy Director of the Oakland Institute. “The high stakes around control of Ukraine’s vast agricultural sector, the world’s third largest exporter of corn and fifth largest exporter of wheat, constitute an oft-overlooked critical factor. In recent years, foreign corporations have acquired more than 1.6 million hectares of Ukrainian land,” he continued. An additional deal signed with China for 3 million hectares of farmland in September 2013 is in limbo, since it is unclear whether the freshly minted government and its new Western allies will allow it to go forward. Walking on the West Side exposes how the international financial institutions serve the interests of agribusiness corporations through deregulation of the food and agriculture sectors and policies favoring foreign land acquisitions. Ukraine is also one of the 10 pilot countries in the World Bank’s new Benchmarking the Business of Agriculture (BBA) project, a widely criticized ranking system that promotes agricultural policy reforms including the deregulation of seed and fertilizer markets. “The Bank’s activities and its loan and reform programs in Ukraine seem to be working toward a single goal, which is to favor the expansion of large industrial holdings in Ukrainian agriculture owned by foreign entities,” said Mousseau. OAKLAND, CA (April 10) – As the spring meetings of the World Bank get underway in Washington, DC, 180 organizations, including NGOs, unions, and farmer and consumer groups from over 80 countries, demand that the World Bank end its Doing Business rankings and its support of the rampant theft of land and resources from some of the world’s poorest people — farmers, pastoralists, and indigenous communities, many of whom are essential food producers for the entire planet. “The World Bank is facilitating land grabs and sowing poverty by putting the interests of foreign investors before those of locals,” said Anuradha Mittal, Executive Director of the Oakland Institute. “Smallholder farmers are the first investors and employers in the agricultural sector in developing countries. Instead of supporting them, the World Bank encourages the looting of their resources for the benefit of foreign companies and local businessmen,” said Alnoor Ladha, Executive Director of /The Rules. The Bank’s “Doing Business” rankings, which score countries according to how Washington officials perceive the “ease of doing business” there, have caused many developing-country leaders to deregulate their economies in hopes of attracting foreign investment. But what the Bank considers beneficial for foreign business is very often the exact opposite for the local communities. “The Doing Business ranking and the new Benchmarking the Business of Agriculture that the Bank is currently developing is pushing governments to give away their country to private interests. They should instead support family farms and secure their durable access to land, which is the key to the economic, social and environmental future of our countries,” said Ibrahim Coulibaly, President of the Coordination Nationale des Organisations Paysannes du Mali (CNOP) and Vice President of the network of Peasant organizations and Producers in West Africa (ROPPA). In the agricultural sector, the rankings encourage governments to commoditize their land — and to sell or lease it to foreign investors, regardless of environmental or social impact. Smallholder farmers, pastoralists, and the indigenous peoples are casualties of this approach, as governments and foreign corporations work hand-in-hand to dispossess them of their land — and gain World Bank’s approval in the process. The results have been devastating. Thanks to reforms and policies guided by the Bank, 20 percent of the arable land in Sierra Leone taken from rural populations has been leased to foreign sugar cane and palm oil producers. In Liberia, British, Malaysian, and Indonesian palm-oil giants have secured long-term leases for over 1.5 million acres of land formerly held by local communities. In the Philippines, world’s third most popular destination for foreign investment in land, 5.2 million hectares have been acquired by corporations since 2006. “Doing Business ranking is a sword of Damocles over the heads of our leaders who wait for their next score in the ranking to gain legitimacy before the international financial institutions, those who prescribe development schemes for our countries, instead of the citizens. We want our autonomy to decide the future of our land, agricultural and food policies,“ said Amadou Kanoute, Director of CICODEV Africa. “The BBA will limit governments’ capacity to pursue their own food policy objectives, further enable the corporate takeover of land and other resources and reduce labor protection for agricultural workers who already suffer from serious decent work deficits, ” said Ron Oswald, general secretary of the global food and agricultural workers union, IUF. For more information or to schedule an interview spokespeople of the campaign please contact Kristen Thomaselli at (202) 471-4228 ext. 101 or kristen@keybridge.biz. OAKLAND, Calif. (March 31) — Today, the Oakland Institute and /The Rules, along with other NGOs, farmer and consumer organizations from around the world launch a campaign, Our Land Our Business, to hold the World Bank accountable for its role in the rampant theft of land and resources from some of the world’s poorest people — farmers, pastoralists and indigenous communities, many of whom are essential food producers for the entire planet. “Small holder farmers and herders are currently feeding 80 per cent of the developing world. Casting them aside in favor of industrial farming corporations from the West betrays the World Bank’s reckless and short term approach to development,” said Alnoor Ladha, Executive Director of /The Rules. The Bank’s “Doing Business” rankings, which score countries according to how Washington officials perceive the “ease of doing business” there, have caused many developing-country leaders to deregulate their economies in hopes of attracting foreign investment. But what the World Bank considers beneficial for foreign business is very often the exact opposite for existing farmers and herders. In the agricultural sector, the rankings encourage governments to commoditize their land — and to sell or lease it to foreign investors, regardless of environmental or social impact. Smallholder farmers, pastoralists, and the indigenous peoples are casualties of this approach, as governments and foreign corporations work hand-in-hand to dispossess them of their land — and gain World Bank approval in the process. The results have already been devastating. Thanks to reforms and policies guided by the Bank, Sierra Leone has taken 20 percent of its arable land from rural populations and leased it to foreign sugar cane and palm oil producers. And in Liberia, British, Malaysian, and Indonesian palm-oil giants have secured long-term leases for over 1.5 million acres of land formerly held by local communities. Now the land-grab problem is about to get worse. Under pressure from the G8 and with funding from the Gates Foundation, the Bank is doubling down on its rankings fetish by introducing a new program called “Benchmarking the Business of Agriculture” (BBA). The BBA’s explicit goal is to promote “the emergence of a stronger commercial agriculture sector.” Its rankings will prize deregulation of the agriculture sector and is expected to enable further land grabbing around the world.